According to survey, up to 60 percent of Russian men and 22 percent of women smoke, and the 85 percent of them began smoking before they turned 20. Source: PhotoXPress. The Ministry of Health has developed a harsh draft anti-tobacco law that would ban smoking in public areas and remove smoking areas from institutions, hospitals and cafés. The draft will be submitted to the State Duma during the fall session. It has been 11 years since the Russian authorities passed a law limiting smoking, four years since Russia ratified the anti-tobacco convention of the World Health Organization, and two years since Vladimir Putin signed the Governmental Concept for Restriction of Tobacco Consumption. Nevertheless, according to Dmitry Yanin, the head of the international Confederation of Consumer, Russia remains one of the heaviest smoking countries in the world. According to Yanin’s data, up to 60 percent of Russian men and 22 percent of women smoke, and the 85 percent of them began smoking before they turned 20. The draft bill is not really new: a year ago the document was put up for discussion at the official site of the agency, which was then called the Ministry of Public Health and Social Development. On May 20, 2012 the head of the newly formed Ministry of Health submitted the draft law to the government, but two days later the document was sent back for further development at the insistence of the Ministry of Economic Development and Trade, the Ministry of Industry and Trade and the Ministry of Agriculture. These agencies believe that strict bans will have an adverse effect on tobacco manufacturers. Representatives of major market players, including Philip Morris and British American Tobacco, have expressed concern about owners of small-scale retail outlets who could be banned from cigarette trade by the new law. There are about one million such outlets in Russia. Restricting smoking with the intention of eventually creating a total ban on the practice is a global trend, say the supporters of the initiative of the Ministry of Health, citing examples in Europe and the United States. Health Minister Veronika Skvortsova says that the Russian measures will once again be submitted for the consideration to the Government on Oct. 17, and if successful, will be submitted to the State Duma. If they discriminate smokers heavily, there is going to be an upheaval. I’d go to the streets to show my protest if I have to. Even though I don’t support than kind of actions. I don’t feel any significant impairment of my rights, people are smoking everywhere. The only problem is that cigarettes get more expensive, but other than that, it’s fine. To be honest, I’d actually want them to limit the rights of smokers a bit. I’d be glad to give it up, but I can’t because my work is very stressful. I do feel than my rights are impaired. First of all this is because of the ban on smoking in public places, for example in cafés. Smokes one cigarette a day. 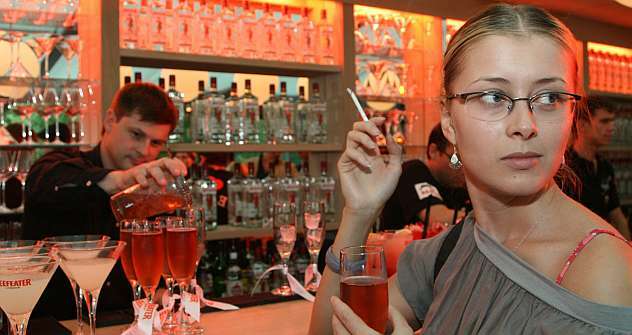 Russians are the most spoiled smokers. Only Chinese smokers are probably more spoiled. In Russia, you can smoke anywhere and disregard everyone. It’s a bad thing. I can easily understand non-smokers when they get angry. I make it a point to not smoke in public areas. But the state cannot regulate the relations between smokers and non-smokers. It is a matter of a personal culture. It your smoke troubles someone, just move aside.